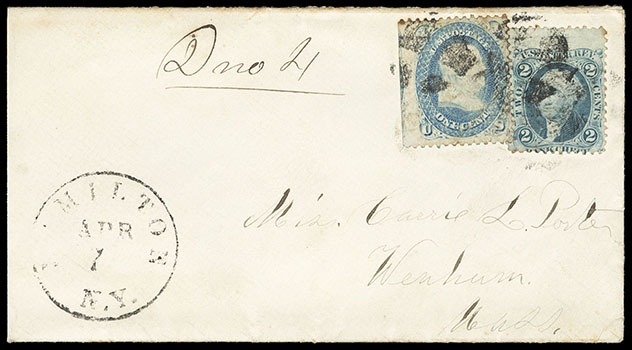 1861, 1¢ blue, used with 2¢ Bank Check (R5c), tied by quartered cork cancels on cover to Wenham Mass., matching "Hamilton N.Y., Apr 7" cds, revenue stamp was not recognized and manuscript "Due 4" rating for 2¢ postage due plus 2¢ fine; reduced slightly at left, Very Fine. Scott No. 63 Estimate $300 - 400. 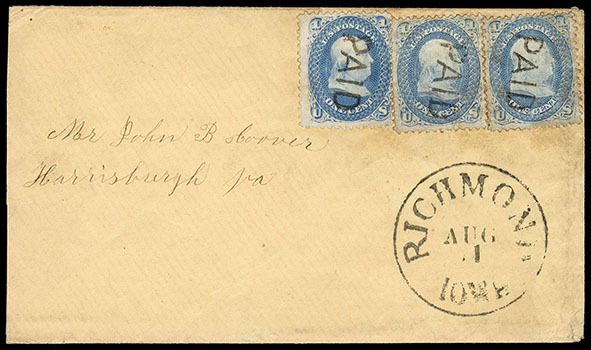 1861, 1¢ blue, three singles, small flaws, each canceled by straight line "Paid" handstamp on cover to Harrisburgh, Pa., matching "Richmond, Iowa, Aug 1" cds below, F.-V.F. 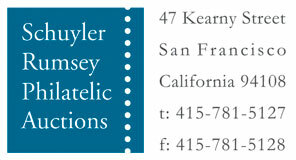 and attractive; with 2018 P.F. certificate. 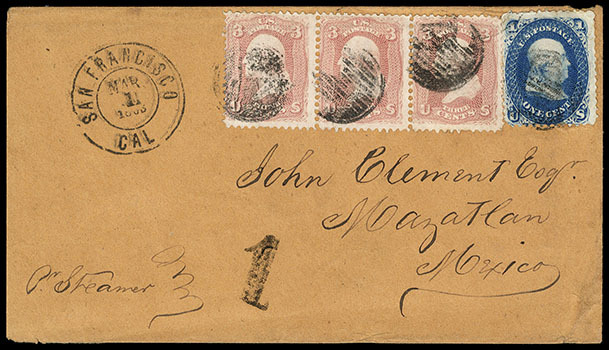 1861, 1¢ blue, used with 3¢ rose (65) strip of three, all tied by encircled grid cancels duplexed with "San Francisco Cal., Mar 1, 1863" cds on orange buff cover to Mazatlan, Mexico, endorsed "Pr Steamer", Mexican "1" reales inland postage due handstamp; stamp faults, a Very Fine use. Scott No. 63 Estimate $200 - 300. 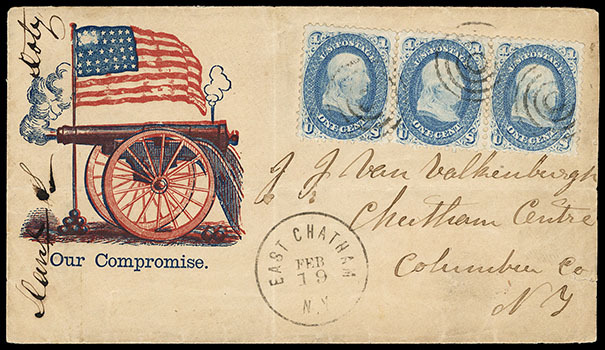 1861, 1¢ blue, strip of three, tied by four-ring cancels, matching "East Chatham N.Y., Feb 19" cds on "Our Compromise" patriotic design showing Flag and Cannon cover to Chatham Centre N.Y.; small flaws, F.-V.F. 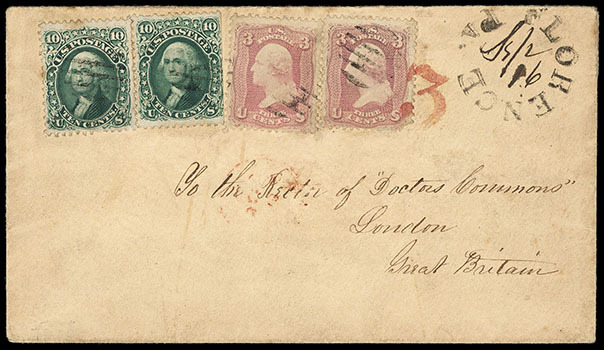 1861, 3¢ pink, two singles, used with two 10¢ green (68) singles, all tied by grid cancels on light buff cover ton London, England, rimless "Florence Pa." with manuscript "Sep 16" dating, New York red "3" credit handstamp to G.B. also ties right 3¢, indistinct strike of red London arrival cds; 3¢ stamp lightly soiled, right 3¢ faulty corner, F.-V.F., a scarce transatlantic use of the 3¢ pink; with 2000 P.F. certificate. Scott No. 64 Estimate $500 - 750. 1861, 3¢ pink, tied by "Akron O., Nov 1" cds on circa 1861 light buff cover with Abraham Lincoln, beardless three-quarter portrait in oval campaign design (Milgram AL-13), J.M. Whittemore & Co. imprint, cover to Twinsburgh Oh. ; barely reduced at left, light overall toning, F.-V.F. 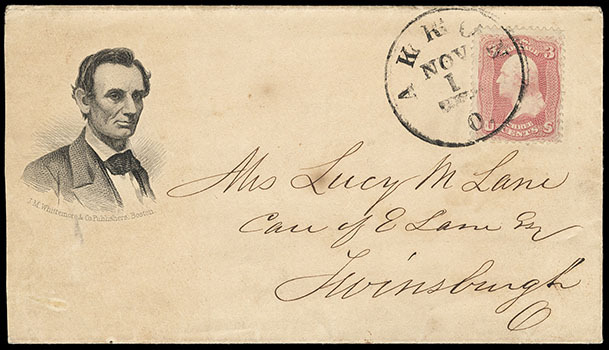 a rare use of a pink on a Lincoln campaign envelope. Scott No. 64 Estimate $400 - 600. 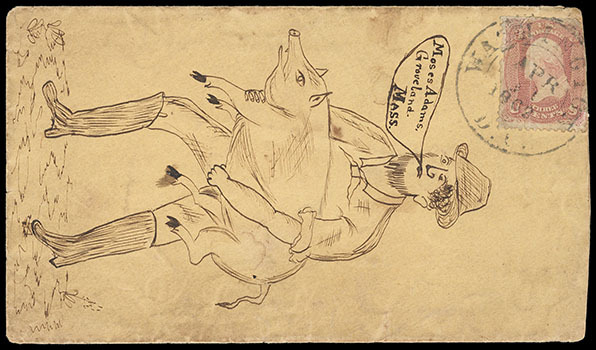 1861, 3¢ rose pink, tied by "Washington, D.C., Apr 11, 1862" cds on illustrated cover showing Farmer with Pig with addressed incorporated into speech balloon; slight cover soiling and stamp flaws, F.-V.F. Scott No. 64b Estimate $400 - 600. 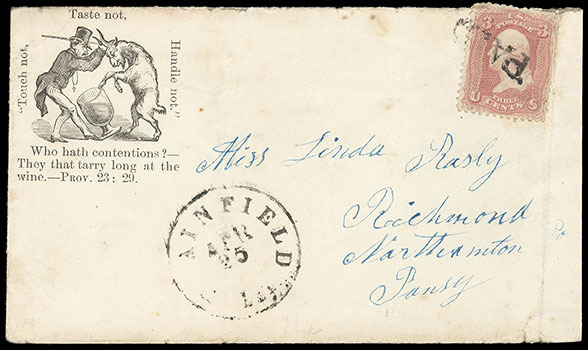 1861, 3¢ rose pink, tied by "Paid" cancel, matching "Plainfield Ill., Apr 25" cds on cover to Richmond with Philadelphia Tract House "Touch not, Taste not, Handle not" patriotic temperance design showing Man Restraining Drinking Goat with "Touch not, Taste not, Handle not." slogan and Proverb below, reverse with Tract House imprint and flowing fountain illustration; faults, Fine and rare design, ex-John Fox sale 10/21/1958 lot 193. Scott No. 64b Estimate $200 - 300. 1861, 3¢ rose, canceled by fancy star handstamp on bronze illustrated T.H. 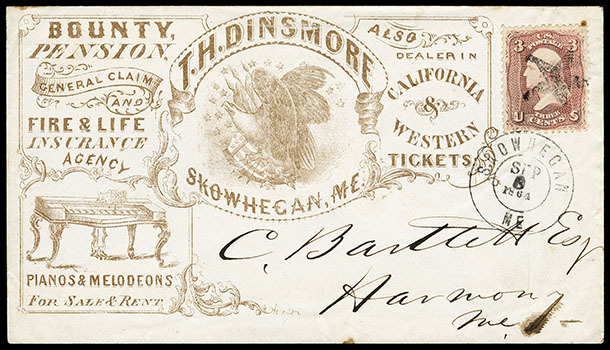 Dinsmore ad cover showing Eagle & Shield and Melodeon illustrations, tied by "Skowhegan, Me., Sep 8, 1864" cds, Very Fine and choice, an attractive ad and fancy cancel combination. Scott No. 65 Estimate $500 - 750. 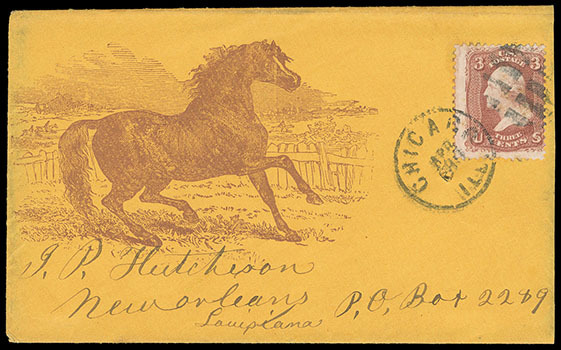 1861, 3¢ rose, tied by Chicago, Ill. cds and grid duplex on orange cover with purple Horse illustration, addressed to New Orleans, La. ; cover slightly reduced at right, Very Fine.